Yep, finally got my second Elite, with trading. I too had Explorer some time ago, and I am slowly working on Combat (Deadly +35% now). For me, Trade will be the last, if I ever get it. I got my Trader Elite during Smeaton Orbital passenger hype. Then after two trips to Sag A* I was still couple of percent away from Exploration Elite and had to scan dozen of Road to Riches systems, which was quite boring. Congratulations of getting Elite trader...well done. I just got mine a couple of days ago..... can't figure out how to put the image in yet. also am a million light year explorer at the same time.... feeling pretty good about that achievement. Now if they only had a progression for mining......must be the ugly step daughter of the family. Last edited by yah-ta-hey on Mon Jan 21, 2019 9:00 pm, edited 1 time in total. "I WISH I WAS A SPACEMAN, THE FASTEST GUY ALIVE" BUT I AINT . with apology to fireball XL-5. 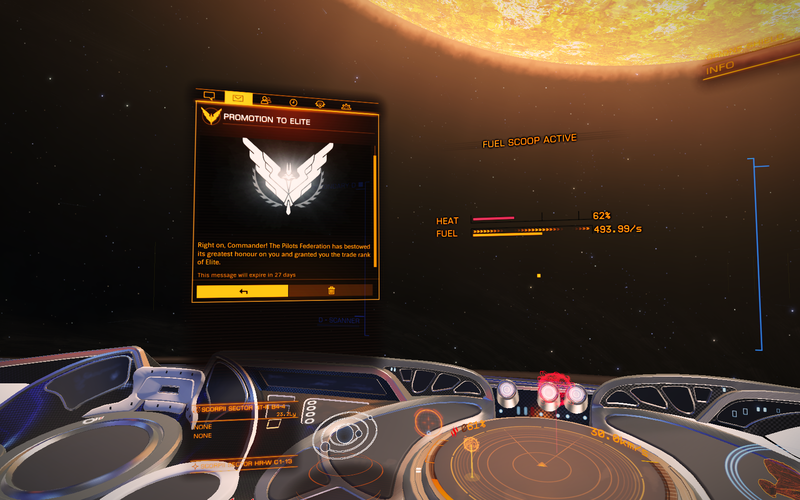 yah-ta-hey wrote: Congratulations of getting Elite trader...well done. I believe mining falls under the "trading" umbrella. Yes, I knew that but who doesn"t want to be known as the Galaxy's Top Miner. I sense a sarcasm there , did you know in the regular forum, there is a movement afoot that wants to have a separate mining progression.? I found it by accident last night.